Lately I’ve had great fun with the miniature quadcopter Hubsan X4 H107C. I’ve already lost the first I got, and the second was this one from Deal Extreme. Right now, they all seems to be sold out, but there are hundreds of other brands to choose from in all price ranges. Starting with this single axis “flying saucer” at only $15. The first quadcopters start at about $30, and most of them seem to be copies of the Hubsan. They have a Walkera with GPS hold starting at $333, all the way up to the 6 channel version which supports First Person View (FPV) glasses. For the Hubsan X4, there are a few extras to get. First of all, the propellers will break, so make sure to get plenty of replacements. Also be aware that they are directional, so there are two of each kind in a bag. A few extra batteries are nice, since a single one will only give about 8 minutes of light time with almost an hour charge time. So to avoid spending hours charging them, some extra chargers also come in handy. Finally, a micro SD card is required for the camera; 2 GB, or even only 1 GB is plenty. And up and up it goes! Until the wind takes it away, it lands on an inaccessible rooftop and you’ll have to get another one. Using the Double Horse 9053 Volitation (Revell “Big One Pro”) I wrote about earlier, I’ve now embarked on a project to make it an autonomous flying and stabilizing helicopter. (First let me have a rant at the term “Unmanned Aerial Vehicle” which is being thrown around. For model RC vehicles of any kind, it goes without saying that it is unmanned. Not even if a midget would fit in your model plane would you put him in there! So, UAV is a redundant non-descriptive term for most model aircraft. On the other hand, autonomous aerial vehicle would be a better term for what most hobbyists are trying to archive with “drones”). With that out of the way, let’s look at the technical details, and what lessons to take away so far. The first step involves the Ultrasonic Range Finder I just got, pointing downwards to give hight information. 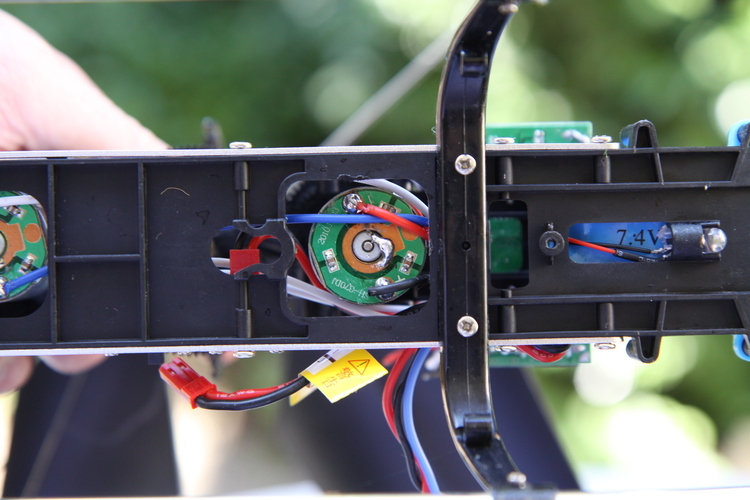 To more easily mount that, and the Arudino, I put a whole blank PCB between the landing skids and helicopter body, as seen in the pictures above. Now, it doesn’t look pretty, and is adding unnecessary weight, but this is just a prototype so far. The PCB made it easy to route and solder a few extra wires, and also add a radio transmitter: The 433.92 MHz transmitter I got a while back, seen to the right in the close-up picture below. Although the Double Horse 9053 Volitation is a medium to big coaxial model helicopter, it does not have much extra lift power. 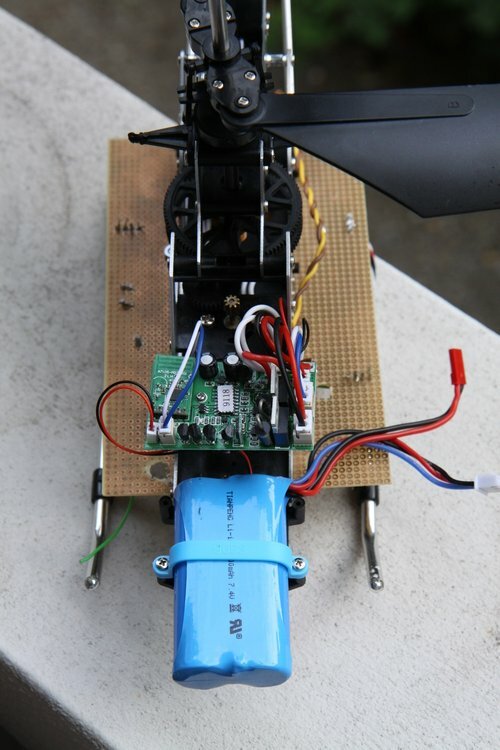 When loaded with the essential parts already mentioned, plus an extra LiPo battery to power it all, it would barely take off, and then just bounce along the ground. First lesson learnt; an extra battery is a no-go, so I would have to share power with the helicopter RC system and motors. That’s a 2 cell 7.4 V LiPo, so works for the Arduino, but hopefully I’ll be able to move to a 3 cell 11.1 V at some point. 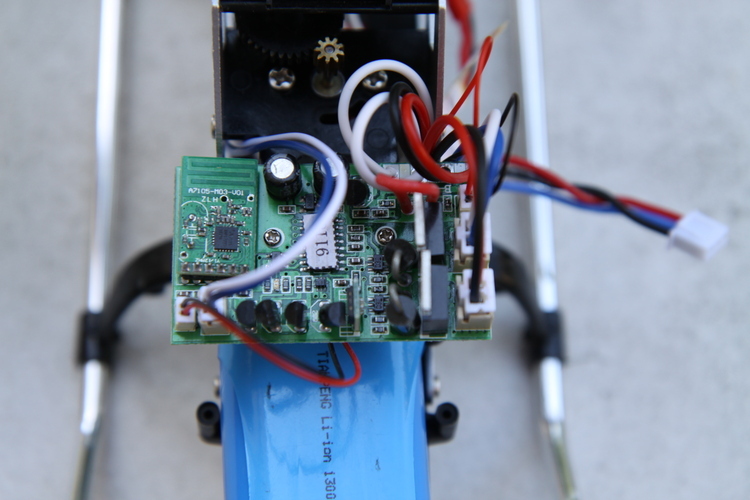 So far I’ve just soldered an extra wire onto the original helicopter board (right hand picture above). Long term, I’m planning to replace that board entirely. That should put the balancing right again, as now the whole setup got tail-heavy, and it’s actually difficult to pitch down. 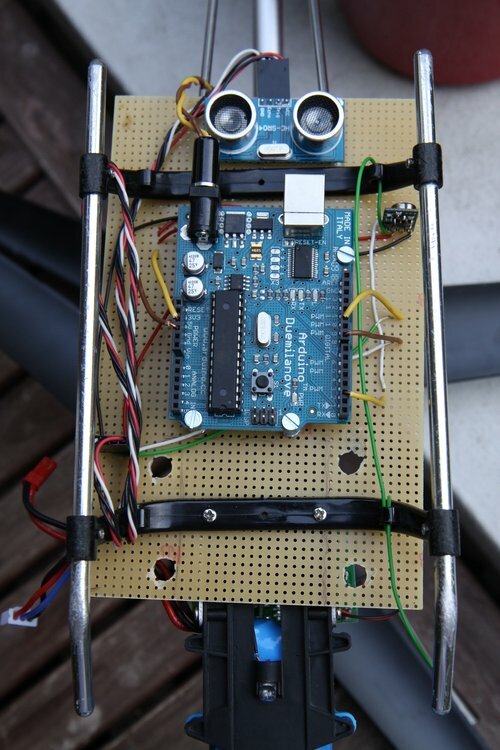 Once the Arudino, range finder and radio link was mounted, I started programming everything. At this point, it wasn’t much code required, but it revealed a new point: When the Virtual Wire library is used to transmit the height information, it interferes with the reading from the range sensor. The VW library works with an interrupt routine, so maybe I could untangle it by avoiding the interrupt. The interesting bit is that the reading from the range sensor decreases the recorded distance. Intuitively, one would maybe have expected that the added delay from the interrupt would have caused the echo timing to be prolonged, whoever the opposite happens. With only the range sensor library active, I started with a distance of about 196 cm. That went down to ~166 cm once the vw_setup() routine was activated, and further down to ~155 cm once the vw_send() was used. Finally, the setup of the VW somehow obscured the pin mode setting from the Ultrasonic library, thus I had to re-set the in/out pins for the range finder after the vw_setup() call. 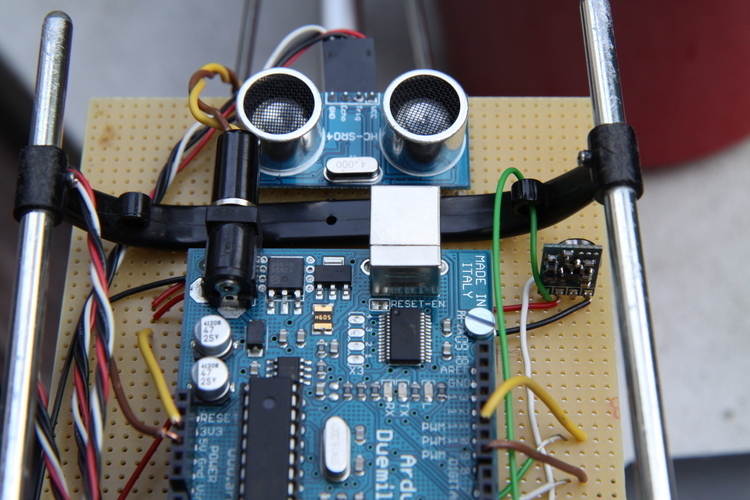 On the receiving end, I simply used a second Arduino, loaded with the VW Receiver example sketch. An obvious draw-back with this setup is that communication is one-way. 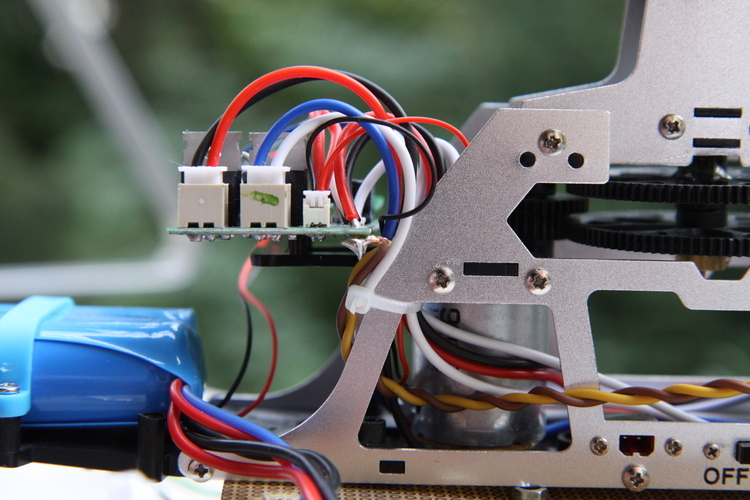 The next step will probably be with something like the Xbee modules, which will hopefully speed up transmission as well. I got my first helicopter this week, a Revell “Big One Pro” Coaxial 3 channel 2.4 GHz. At 100 Euros and only 3 channels, I was warned by the sales clerk that it was merely a toy, however, what are these models for if not to play with? This model is so similar to the Double Horse 9053 Volitation, that I am assuming it is just re-braned by Revell. As far as I understand, the Double Horse line is made by Shuang-ma. 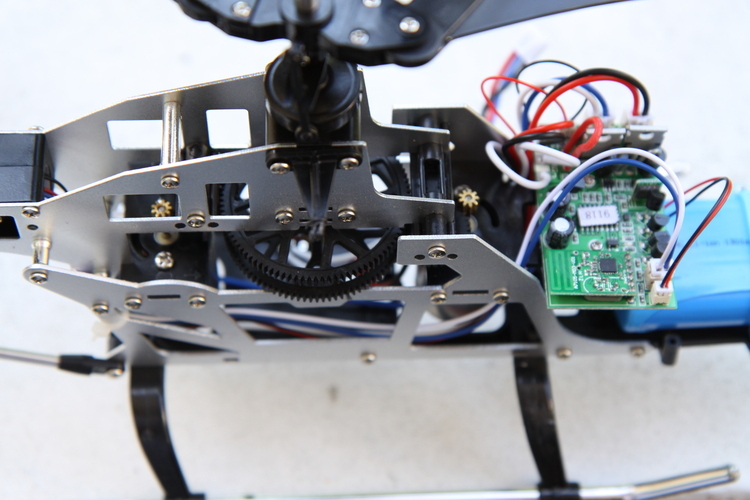 Comparing it to my AR.Drone which broke down last year, it has several interesting properties and features: Overall, I am impressed by the simplicity yet robustness of the frame construction, mechanics and electronics. Most of the frame is in what I assume is aluminium or magnesium, with a few parts of plastic in between. It feels solid, which a number of crashes have proved. The controller / main board is refreshingly simple, but also modular in the sense that motors and LEDs are JST plugged rather than soldered. Only the battery connector and power switch is soldered directly onto the board. This looks very promising as a platform to experiment with. Apart from the basic electronic components, there are only three interesting chips: The radio receiver; what I assume is the main chip (designated 9118) and a vertically mounted chip, some kind of gyro maybe? 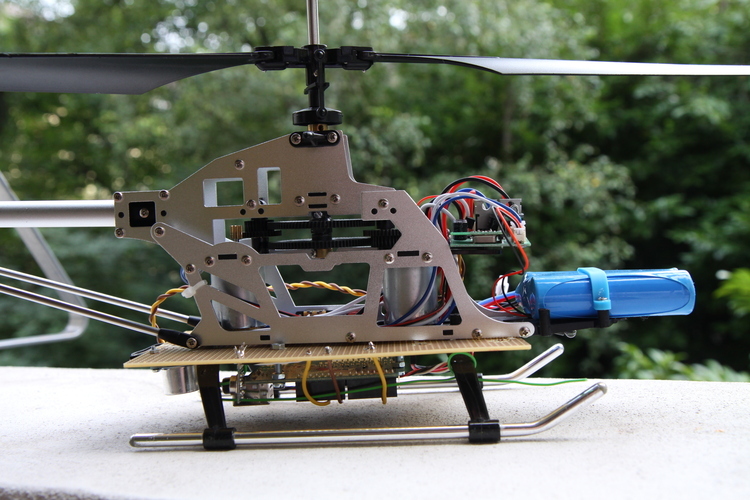 Compared to the AR.Drone, refreshingly simple. Shuang-ma charges $15 for a replacement board, and they seem to be available many other places as well. 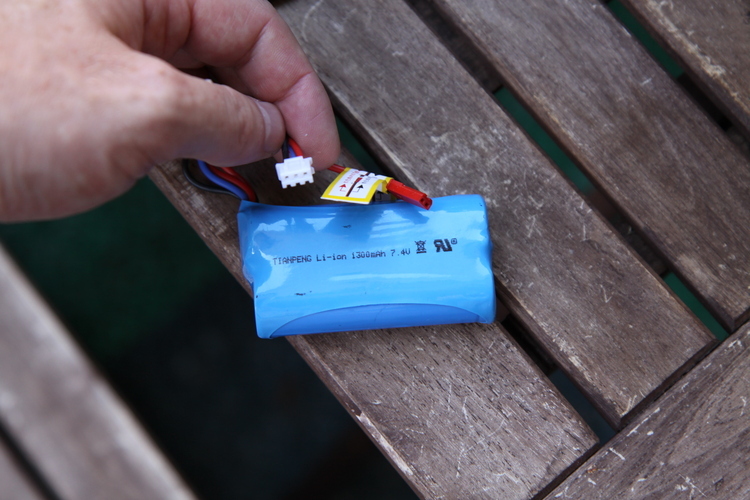 The battery is a 7.4 V 1300 mAh 2 sell LiPo, with brand name Tianpeng. Revell sells a spare one for 22 Euros, but I found a similar at DealExtreme for $10.5 so ordered that. Then Hobby King has a 1000 mAh for $3.5 so could try that as well. Finally, the two main motors are designated 9093. I cannot see any make, but they look similar to this Syma Dragonfly. It would be interesting to find more specs on those. So, I’ve been given a lot of praise. Are there any down-sides? Well, yeah. First, the plastic hull or shell is of the most fragile kind. After the first flight and crash, there was already a crack. And on the second day a big piece came off. So now I’ve used all the electrical tape I could find and taped it all together. It doesn’t look so nice, but at least it will not crack so easily. I considered removing the hull altogether, however it does protect the LiPo from taking a direct hit in a crash, which is probably good enough reason for keeping it. Once I get into changing a lot of batteries, I might reconsider that, though. Speaking of batteries again. Five minutes flight time a couple of times a day is not too much fun. In fact, it is rather poor. As mentioned, I’ve already ordered more, but I wonder if it would be possible to combine some for a bit longer flight time as well. Finally, on negative notes, the axis for the lower rotor come loose quite often, after a few crashes. I just have to tighten the two screws attaching the lower gear, but is still a bit annoying. Maybe there’s a better solution to that. Overall, I think it was a good buy. Had some fun already, and hoping for plenty of more. Then there are several potential projects and thinking to get into, and repairs to make.